Hi everyone! I have to admit that the lack of updating for the past few days has made my heart grow fonder for you all. Things have been so busy around here with wedding preps, going around the church, and taking tests, but that makes those times of rest and catching up that much more enjoyable! :) One thing I've been learning is that our character gets truly tested in the fire when times get busy. Am I keeping my eyes on Jesus during busy times? Or am I just living day in and day out, without giving a care for those around me, particularly God Himself? These days, it seems that God has been graciously opening my eyes even more to everyone that's around me. It can be somewhat overwhelming when I can feel what everyone is going through; however, I'm learning to hone into those times of discernment to be of further help and comfort to those who are hurting. It's always a blessing to be aware and intentional in wanting to bless others, because not only does that lead us to pray for people, but it draws us nearer to God as we get to know His heart. My prayer each day is, "Lord, break my heart for what breaks Yours." Since I've been eating dinner earlier than usual, I wake up with a ravenous stomach and always crave something a little more out of the ordinary. 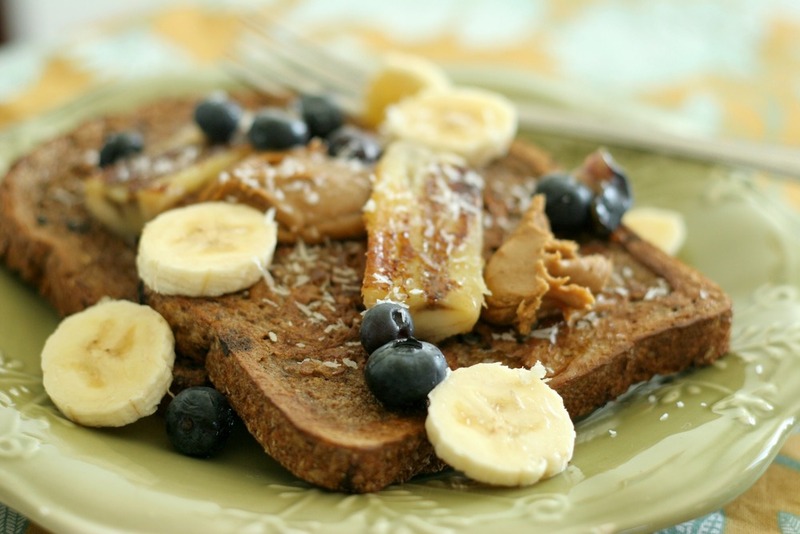 I present you Carob Cinnamon French Toast! Yes, you read that correctly. It was so delicious, decadent, yet packed with a lot of nutrients. The egg gives it more protein, and the Ezekiel Sprouted Grain bread is filled with fiber. I like most of the Ezekiel bread products, but the Sprouted Grain is one of my favorites because it seems to stay fresh for a longer period of time and is softer than the other ones. This french toast was made with a mixture of egg, milk, lots of cinnamon, carob powder, and a few drops of vanilla Stevia. I was pretty excited to try these pre-steamed lentils from TJ's because I love lentils so much! I actually don't eat them too often because I don't always feel like boiling or cooking them. Thus, I went ahead and made this awesome purchase because it's so convenient for those busy days. I warmed up some cheese and lentils on top of a baked purple yam, or sweet potato, err....I really don't know what it is! But it's a staple in a Korean household, hah! The sides featured Italian herb brussel sprouts along with Korean dumplings. Note: Make sure that you don’t lock your knees during the dead lifts and look straight forward. Keep your spine straight when performing the bent lateral raises, and only bent at the hips. I'm not positive if we need to do this within the same day, but I prefer to do it if time allows. If not, then I will compensate for that the next time I exercise. Either way, balancing it out is utterly essential because if the quads are extremely strong yet our hamstrings are rather weak, then it may potentially cause injuries while we run. Remember that time when I thought I was an overpronator? Well, it actually turns out that I oversupinate!!! This, along with an imbalance between my quads and hams had caused my achilles discomfort. After not running for about a week, my feet began to heal very quickly. In addition to that, I tried to focus on my hamstrings a bit more, and all that foot and hamstring discomfort magically disappeared altogether! So hallelujah for that! Although I am not a fitness expert, after reading countless articles and having tried these methods to prevent injury first-hand, I truly believe that muscle balance is a must for an holistically healthy body. I hope you have a marvelous day! Do you have a Trader Joe's where you live? What's your favorite item from TJ's? What body part do you neglect, or what exercises do you tend to avoid?